A trip to the mall turns what would be the best day of Jughead’s life into a day of turmoil! And it’s all because of corn dogs and teddy bears! Sounds weird? You couldn’t even begin to imagine it! Find out what the “Wrong Stuff” is in this fun lead story to a hilarious digest! The MEGA MAN / MEGA MAN X crossover is here! The next big video game event from Archie Comics has at last arrived in “DAWN OF X” Part One! It’s a brand new adventure so MEGA-EPIC that it would be impossible to contain it in just one time period! Witness a struggle that spans across time as both the original Mega Man AND X battle a long-lost Wily weapon for the safety of all mankind! Featuring heroes and villains from both hit Capcom franchises, plus the surprise return of a character that will affect the very course of time and space as we know it! Get in on the ground floor of this century-spanning special event that features a cover and variant from Mega Man art legend Patrick “SPAZ” Spaziante, as well as a special “Villain Variant” cover featuring SIGMA and VILE by painter Erik Ly! “X” marks the spot! Sonic Super Digest is BACK and featuring a brand new story! 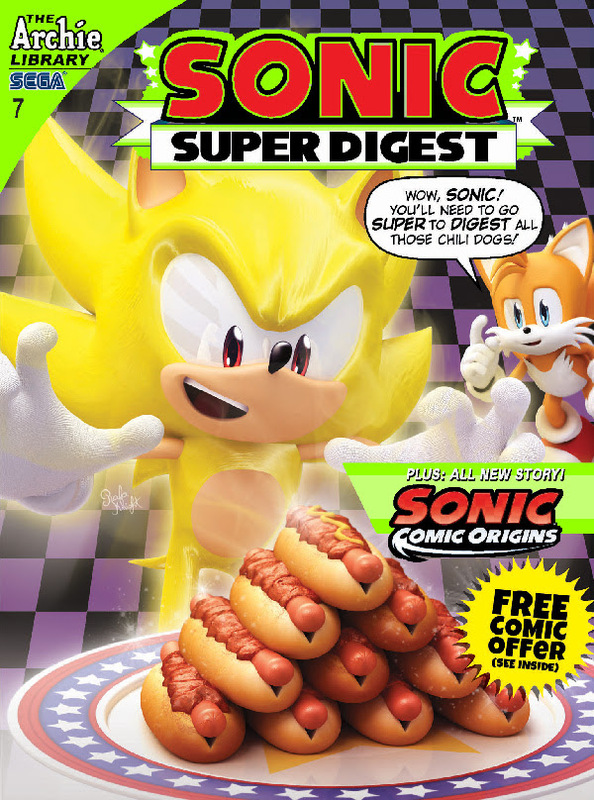 Sonic the Hedgehog’s adventures are now available in the popular digest format. Where Sonic Super Special Magazine leaves off, this quarterly digest collection picks up, with even more classic adventure from the Sonic comic library! The secret origin of the new Sonic universe is REVEALED in the all-new SONIC COMIC ORIGINS mini-feature! Discover a whole new world alongside Sonic the Hedgehog in Sonic Comic Origins, Part Two, featuring new story and art from the superstar Archie Sonic team! All this (and Freedom Fighters too) as we give you more classic Sonic comics as only Sonic Super Digest can provide! Featuring an all-new CG cover from rising Sonic comic star Rafa Knight!